Apple released SMC Firmware Update 1.4 for MacBook and MacBook Pro models sold between 2007 and 2008. The update addresses an issue that prevents these MacBook models from being charged using the new 60W or 85W MagSafe power adapters. 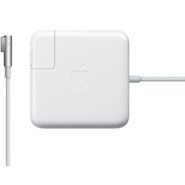 For more info about the update: Portables: L-shaped MagSafe power adapter does not charge computer and LED indicator light does not illuminate. Update download links: MacBook Pro SMC Firmware Update 1.4 – MacBook SMC Firmware Update 1.4.